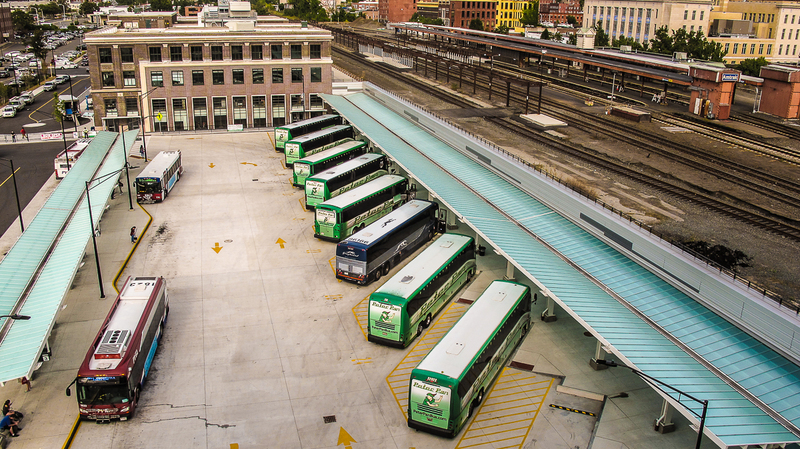 Peter Pan Bus Lines and Greyhound are the latest new tenants at Springfield Union Station. Peter Pan moved on September 5th and Greyhound made the move just a few days later, on September 11th. When Amtrak will move — from their historic station building at track level — into the renovate main waiting room is not clear at the moment. The image above shows the state of affairs at Union Station on a weekday afternoon in mid-September. Seven Peter Pan coaches along with a single Greyhound coach can be seen parked in the intercity berths at the station. On the right is the existing Amtrak portion of the station complex — with its three low-level boarding platforms and station building. A single high-level boarding platform will be built to replace Platform C along with an elevator and stairs to connect the new platform to the concourse level below. The latest report suggests that the platform should be completed by mid-2018. The Connecticut Department of Transportation opened a new three-level parking garage in downtown Meriden last week — an improvement that will make parking more convenient for CTrail Hartford Line Meriden station rail passengers and provide easy access to the City’s new transit-oriented development sites. Parking costs $7 a day and $40 a month, with free parking on weekends and holidays. The garage will also offer discounted parking for riders on the Hartford line. By comparison, the daily parking rate at the new Springfield Union Station garage is $20 a day and $90 a month. Amtrak has announced its intention to overhaul the interior of their fleet of Amfleet I coaches over the next two years. The “refresh” will include new seat cushions, new carpeting, new LED reading lights, new bathroom flooring, upgraded wainscoting and bulkheads, new curtains in the Business Class cars and redesigned galleys in the café cars. New interiors will roll out on the following routes that service the Pioneer Valley: Northeast Regional trains that serve Springfield, the Vermonter, and the Springfield Shuttles. A historical look at the interior of Amtrak’s Amfleet passenger cars through the years. The writer has raised an interesting question whose answer, at the moment, seems to be a mystery. 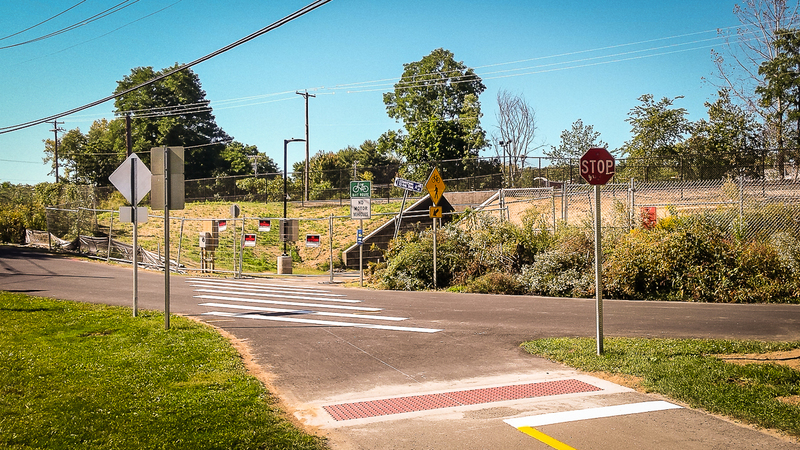 A recent check of the bike/pedestrian underpass work site in Northampton suggests that most of the finish work is now nearly complete — including the new signage and road surface marking. 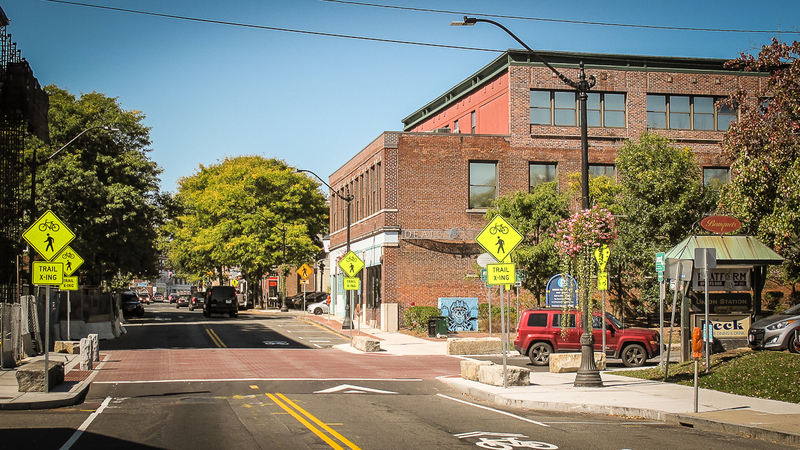 The image above shows that an electric meter has not yet been installed in the panel to the left of the path — which means that electric service at the underpass site has not yet been established by National Grid. Without electric service there is no power for the lighting and surveillance cameras. Many people have reported sighting an odd looking Amtrak train in our area recently. The special train operated northbound on the MassDOT’s Connecticut River Main Line through the Pioneer Valley on Sunday evening September 17th. The train, which was dubbed “The Green Mountain Flyer,” was operated by Amtrak for the American Association Of Private Railroad Car Owners as part of their 2017 Convention in Burlington, Vt. In the YouTube video above you can see the special 18-car train passing through Easthampton, Ma. (near Route 5) on its way to Vermont. If you look closely you will see a total of four dome cars and an open platform observation car. This is clearly not something that we see very often on the tracks in our area. To simplify things a bit, we’ve combined the “Purpose” and “Who We Are” pages into a single new page with the title “About Us”. This new page includes refreshed text and a few images.